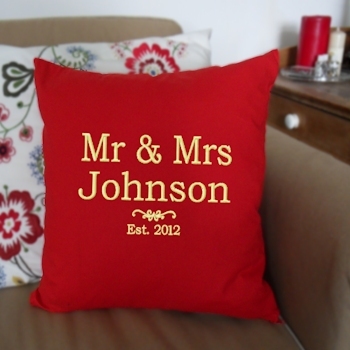 Beautiful personalised red cotton cushion featuring your chosen initials or names embroidered to commemorate a special occasion. Approx 41cm or 16 inch square 100% cotton cushion cover in vibrant red colour. The text is embroidered in your choice of thread colour, letter font style and the option to add a little motif. Personalised gifts are made to order usually within 48 hours.